It was close, but ultimately Wilsonville lost its dual meet against Scappoose 42-34 Wednesday, Jan. 16. Scappoose got the jump on Wilsonville in the first matchup of 106-pounders, as Cash Berry pinned Wilsonville's Kohl Kaiser in just 25 seconds, putting the team up 6-0. The Wildcats were not behind long as they picked up a forfeit victory in the 113-pound division. At 120 pounds, AJ DeGrande of Scappoose got another pin against Wilsonville's own, this time Luke Nelson in 2 minutes, 36 seconds (2:36). Scappoose led 12-6. In the 126-pound division, Wilsonville standout Isaac Quesada once again evened the score with a one-minute pin of Scappoose's Peyten Healey, the score now 12-12 through four divisions. The next three weight classes proved to be the pivotal moments for Scappoose's wrestling squad. 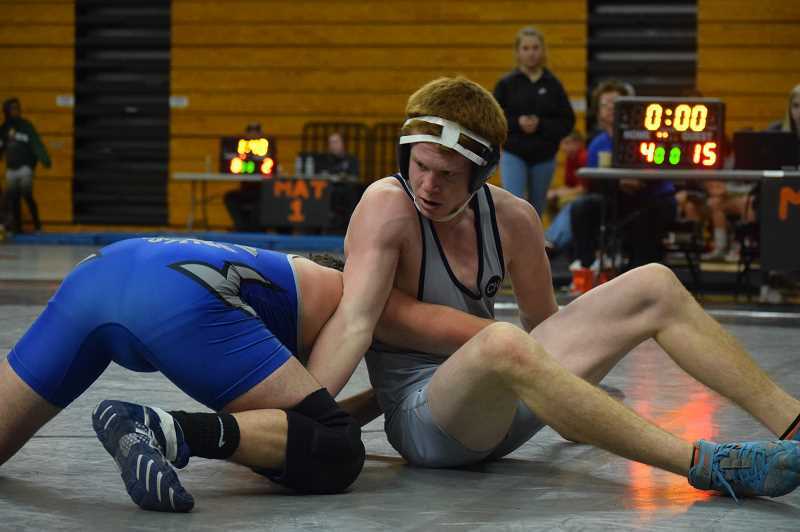 At 132 pounds, Colton Frates scored a major decision over Wilsonville's Caleb Wilde; at 138 pounds, Bella Amaro was awarded a forfeit victory; and at 142 pounds Wilsonville's Austin Sharp suffered a technical fall (19-4) at 5:31 of the match. Scappoose established a 27 12 lead. Wilsonville bounced back well though, as sophomore and last year's state runner up Tyson Resko picked up a pin over Scappoose's Cooper Ragan in just 1:13. The win at 152 pounds netted the Wildcats another six points. At 160 pounds, Justin Carpenter scored a majority decision (12-1) over Scappoose's Max Amaro. The gap was closed to 27-22. At 170 pounds Wilsonville gave up a forfeit to Scappoose's Deacon Smith, and was now down 33-22. The two teams went back and forth over the last four matches. At 182 pounds, Wyatt Miller pinned Scappoose's Raymond Helm in 1:35. 195-pounder Brett Krieger got a forfeit victory for Scappoose, and Wilsonville trailed 39-28. At 220 pounds, Wilsonville's Jake Moore pinned Jackson Lehman at 1:26 of the matchup, and Wilsonville was down 39-34. It came down to the final match, and ultimately Scappoose walked away with the win. Wildcat Noah Ochs lost a 7-3 decision to Cutter Sandstrom, giving up three points and ultimately putting Wilsonville down 42-34. Wilsonville's next meet is on the road against Hillsboro Wednesday, Jan. 23.